I have often though about setting up a page to share some of my gardening techniques. Well, here's a start at it. Let me know if you find it interesting. I'm always happy to share my techniques. Feel free to ask questions. I stopped using rows and conventional gardening techniques in the early '70s. I call my system 'square yard companion planting'. 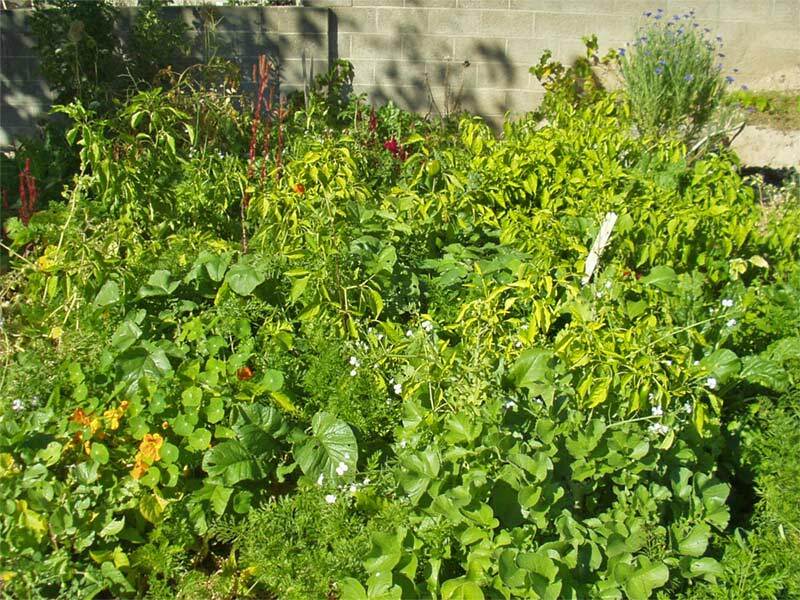 Plants that like or benefit each other are planted together. All of the space is utilized. 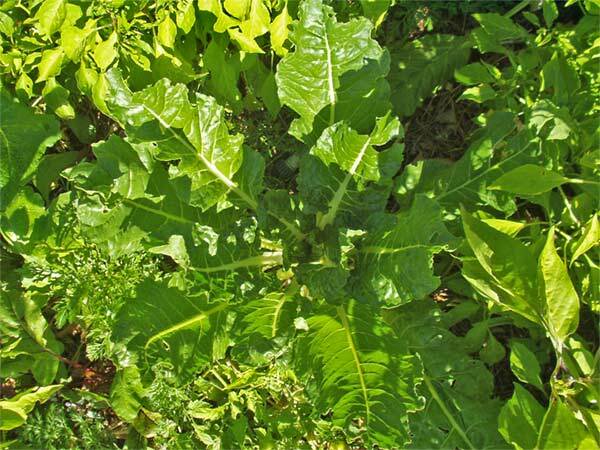 Plants that will mature early are planted between plants that start slowly and mature later. As the early plants mature, they are used and removed to provide more room for the later this has the added benefit of protecting sensitive plants when they are small and reducing evaporation. In this photo, you see mostly peppers. 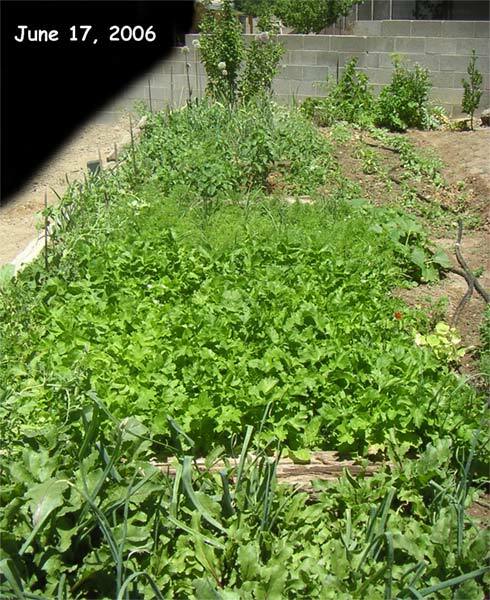 Radishes, turnips, onions, garlic and carrots are planted between them. Nasturtiums, celosia and bachelor buttons, add color and pest control. There are no weeds or grass. This view gives you an idea of how it all starts. The railroad ties are placed about every 3 feet. They are used to provide access to each section. Everything can be reached without stepping into the plots. Water is provided via soaker hoses placed every 10". They are on top of the ground in this shot because this section has peas which were planted very early (February) before I was ready to put the hoses in place. Peas mature early and the section will be replanted with something else after they are through. The hoses work best placed no more than 2" below the surface. Pine needles where used for mulch to help reduce evaporation. The hoses are each 35' long and connect to a manifold through a valve. 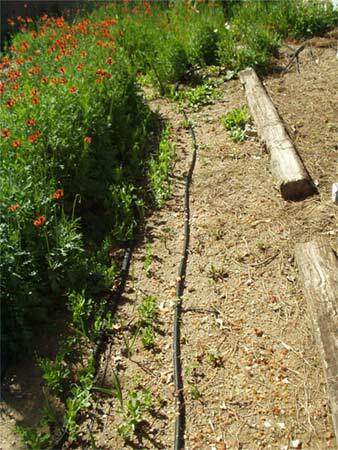 Each hose can be set independently. The pressure in the manifold is maintained at a fairly low level by a regulator. 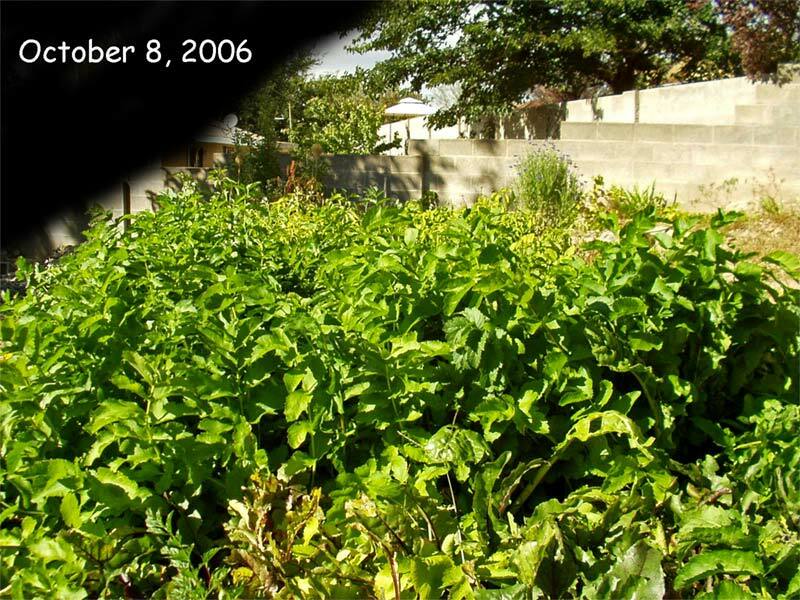 The water runs at a rate of 3 to 7 gallons per hour 24 hours a day to water the entire garden. To put that in perspective, it is equivalent to a fast drip. This is less water than it takes to water our lawn. When it rains we turn the system off for a couple of days. Living in the desert we have to be very frugal with our water usage. I think there is a down side to this method, in that, since the water comes from wells and is stored in tanks, etc. it is never exposed to the air and therefore not aerated. I plan to experiment with building a system to inject air into the water. (Air is mostly nitrogen and CO2 which the plants need.) The system would also let me inject manure 'tea' into the water. Here you see the sections: beets and garlic at the bottom, parsnips next, then carrots with onions, then peppers with lettuce at the top of the photo, just before the apple tree and artichokes. Beans are planted along the left edge for easy access. The soaker hose on the right is in addition to ones that are buried. It is there to keep the top of the soil moist while new seeds are sprouting in that section. It will be removed later. This is the same section a few months later. All you see are parsnips and the tops of the peppers. 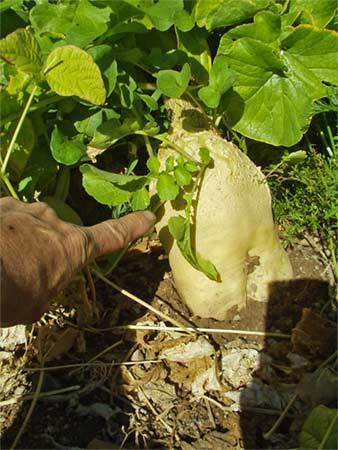 I thin the root crops to a plant every 2-3" and be sure not to plant them directly over the soaker hoses. 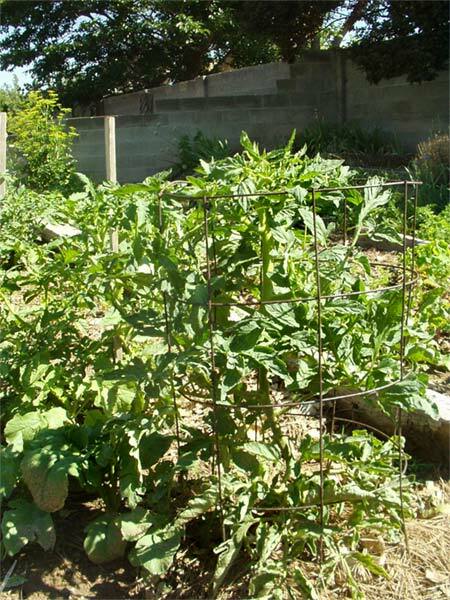 With the plants this close they help protect each other, put inhibit any weeds from getting started. 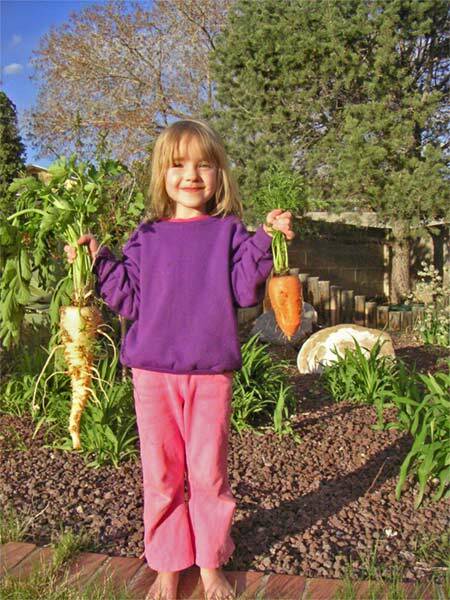 The carrot Nicole is holding is a Danvers Half- Long. Sweet, juicy and tender. 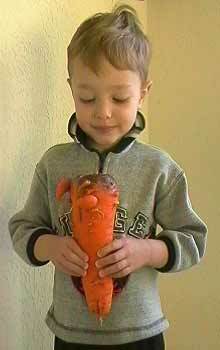 Many of them grow to this size. Left in the ground, they keep until April or May. Nope. 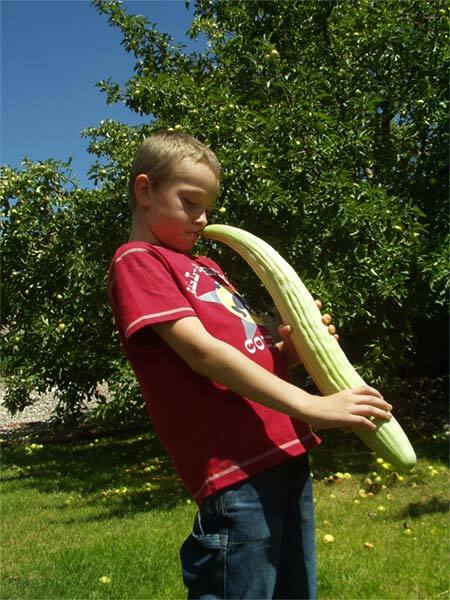 That's a Syrian cucumber that Tyler's playing there. It's just the right size for eating and not bitter at all. Note the apples on the tree behind him. I thin them several times and still left too many. 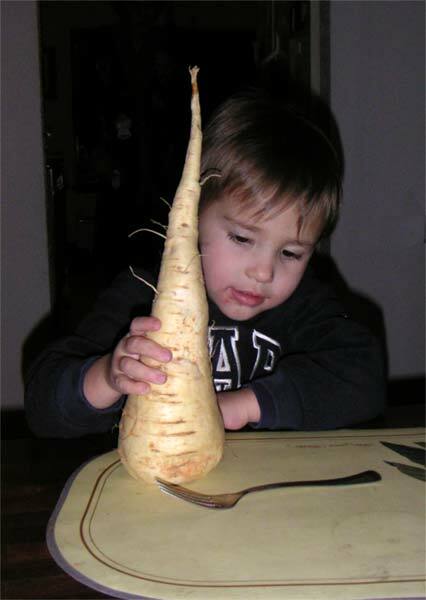 This is a German White Giant radish. This variety is my favorite for our climate. It doesn't bolt and can get quite large before it gets pithy. The ones I left go for seed got up to 4" in diameter this year. Salad Rose is the second best variety I have found for here. 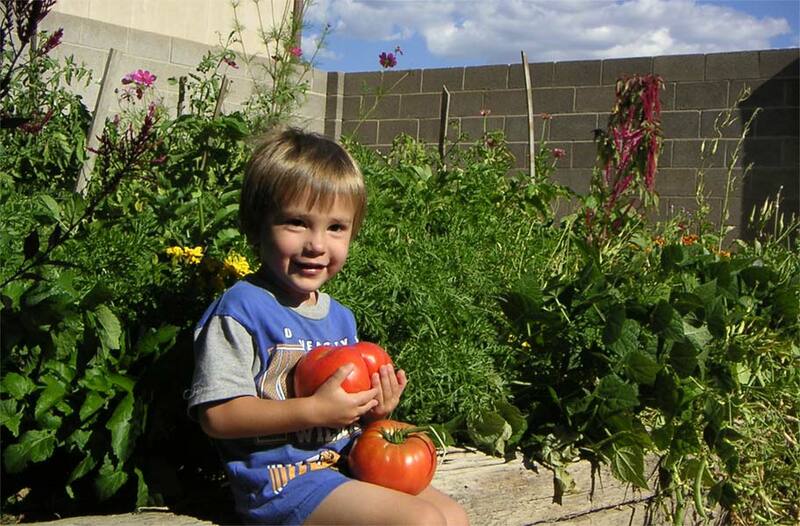 Here's a tomato plant in mid June. By fall it had filled that whole area. 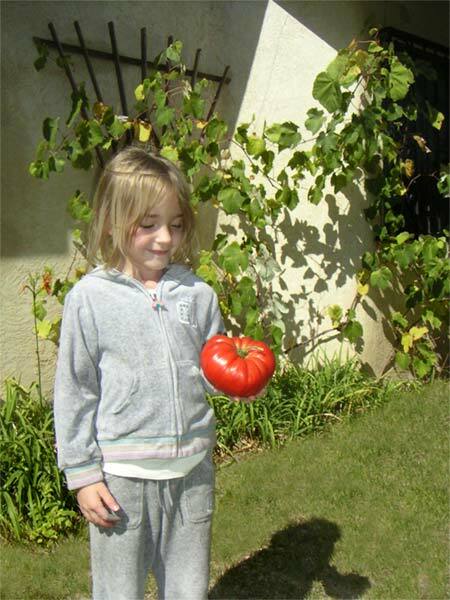 Nicole is showing on of the Better Boy tomatoes. We like the Big Boy and Better Boy about the same. Early Girl is another of our favorites. Esther likes the Roma the best and they are easier to dry. Celebrity didn't have as much flavor. they tasted like store tomatoes. The grape vine behind Nicole is a seedless Concord and has been producing well. You can only see half of it here. The flowers are Day Lilies. They bloom daily for a long time and can be eaten like green beens.